The hole should always be wider than deep, because it is important that the soil come no higher than the soil line on the trunk. Planting a tree too deeply can kill it. The following measurements will serve as a guide to the size of the hole you will dig for your trees. 24" 30"W x 18"D 150-200 lbs. 28" 32"W x 24"D 275-500 lbs. 32" 36"W x 24"D 500-600 lbs. 36" 40:W x 30"D 800-1000 lbs. 40" 48"W x 30"D 1100-1300 lbs. Amending the existing soil with an organic compost is a wise idea where soil improvement is necessary. However, the use of a 100% compost as back fill should be avoided. Blending the existing soil with the amendment provides the root system with the proper blend that assures vigorous root development. Plant trees in well drained soil only! Even plants that are "tolerant" to wet soil conditions will usually not survive in standing water. Elevate the root ball slightly to compensate for wet conditions. Early spring or fall are the best times to plant because rainfall is adequate. In any case, summer watering is recommended the first year or two to successfully establish the tree. Once or twice a month from mid June until the Fall rains come, put a hose on with just a trickle of water, and leave for 12 hours or so. Water which is applied to lawns or flower beds by automated systems or regular sprinklers is inadequate. A mulch of wood chips or bark 3-4 inches deep will help to retain moisture and moderate soil temperatures. Mulch should be spread on an area at least four times the diameter of the root ball, which means the grass should always be kept well away from the tree trunks to prevent injury and to prevent competition between grass and trees for water. When winds are a problem, such as on exposed hilltops, or when the tree has a large, leafy canopy, staking should be done. Wire should be enclosed with some type of rubber or other material where it comes into contact with the tree trunk. Two stakes would be adequate, and should be left in place no longer than a year. 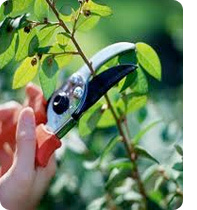 Periodic removal of dead and crossing branches is advised and all pruning must be carefully done in order not to damage the tree and shorten its life considerably. Sunset Western Garden Book is an excellent reference guide for proper pruning techniques. To Remove or Not: Because Oregon Turf and Tree Farms sells only large caliper shade trees, we use wire baskets on all of our trees. They function as support for the root ball, so that it won't fall apart, thereby destroying the tree roots. Documented field experiments have proven that tree roots simply grow around the wires and make a complete union, thereby causing no problems. When planting the trees, the rope holding the burlap around the tree must be removed. The burlap may be cut back to the wire and removed.